CNPS Takes It to the Capitol! 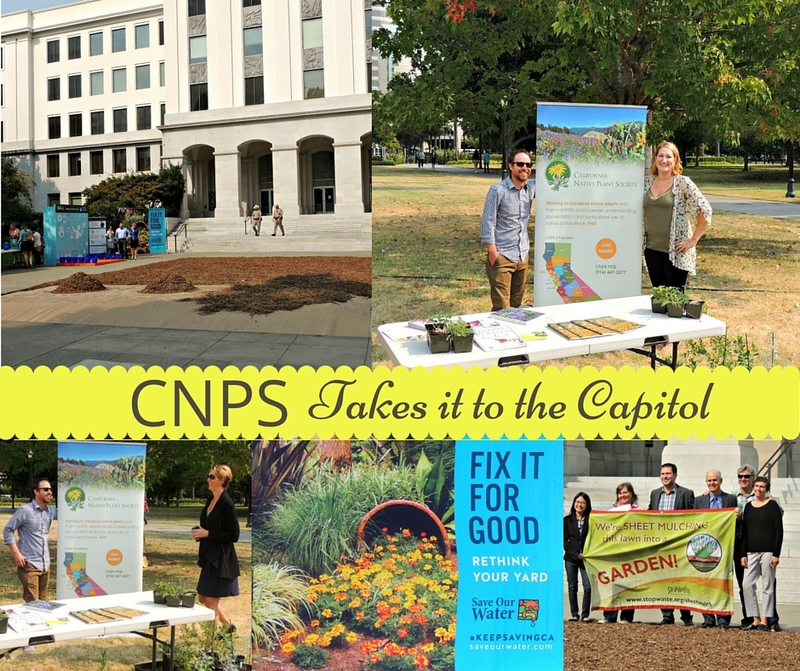 On September 14, CNPS and partners celebrated the launch of Save Our Water’s “Fix It For Good” public education campaign by breaking ground on the Capitol landscape conversion project with a sheet mulch demonstration on the East Lawn of the Capitol. 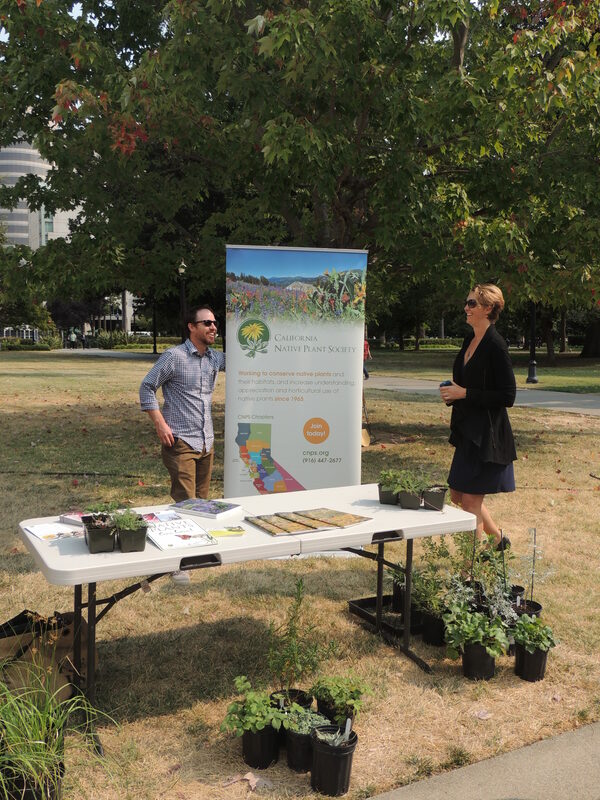 The event was put on by the California Department of General Services to showcase their commitment to rethinking the landscape on the Capitol grounds by converting lawn and other high water use areas to water-wise landscapes featuring California native plants. The goal of the demonstration is to teach the public about sheet mulching, an environmentally friendly lawn conversion technique that removes your lawn, creates a weed barrier, and fortifies your existing soil all without having to haul material off to the landfill. The demonstration was accompanied by a small water conservation expo where partner organizations hosted educational activities and information booths. CNPS had a table set up with a beautiful array of native plants, all which were grown by the Sacramento Valley Chapter’s Elderberry Native Plant Nursery, making the table an instant hit by all passersby! People stopped to tell stories about their own landscape projects, asking for tips on gardening with California native plants and local native selections. This was an ideal opportunity to refer them to upcoming CNPS Chapter plant sales. A plethora of resources were distributed to encourage the blooming interest in native plant horticulture and excitement was rallied for the upcoming California native plant gardens. The launch of the ‘Fix it for Good’ campaign also celebrates CNPS’s partnership with Save Our Water– California’s official statewide water conservation education program. CNPS and Save Our Water are joining forces to teach Californians about the numerous benefits of gardening with California native plants and how they play a critical role in conserving water in the landscape. CNPS developed content for their Gardening with California Native Plants page and wrote a guest blog post on CNPS’s drought resources. This partnership will allow CNPS to reach a wider audience, greatly expanding our outreach efforts on a statewide platform.